Monday, Nov. 26th, produced a hot and sunny start to proceedings when all the drivers and teams arrived for the first day of on-track action at the Circuito Internacional Paladino of Conde in Paraíba, Brazil, hosting the 19th Rotax MAX Challenge Grand Finals. 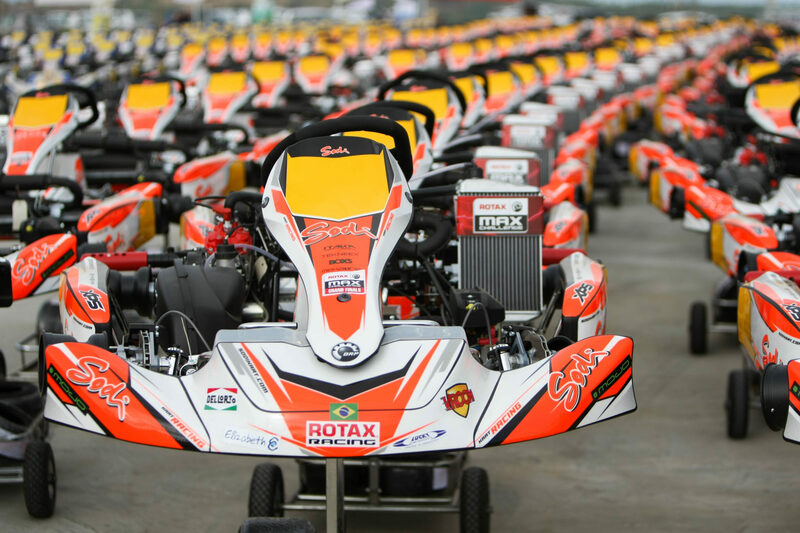 Each Rotax MAX class would get three non-qualifying practices where they would be able to break in the engines and start the work on adjusting the set-up of the chassis to suit this fast and flowing circuit. The first of these sessions was 15 minutes long mainly for the purpose of breaking in the brand new Rotax MAX engines and almost all the classes got these in on a dry track with only light showers of rain that didn’t affect the track grip. The high temperatures and often high winds meant that although it rained multiple times, the track would dry out almost in a matter of minutes during the second group of non-qualifying practices. This resulted in no wet tyres being needed until after the lunch break and the first of the Non-Qualifying Group 3 Sessions for Micro and Mini MAX were the only ones that needed to consider using wets. By the time it got to the Juniors, they were all back on Slick tyres although the track took some time to get back up to speed with all of the classes fastest laps of the day being recorded in NQ-Practice 2. All important information for the drivers and their teams with the forecast predicting similar weather for the week ahead. The drivers were getting to grips with the Paladino International Circuit with most describing it as fast and with high grip levels and a very technical uphill section where you are able to gain or lose a lot of time. The youngest class of the event was topped by Alexander Skjelten of Latvia with a time of 1:00.040 but very close behind was Poland’s Maksymilian Obst who is running the number 1 this week. The final session for these drivers was in the wet so they have been able to experience both conditions already on the first day. Daniil Kukuruzov from Ukraine posted the fastest lap time in the Mini Max category with a 56.419 ahead of France’s Augustin Bernier who managed a 57.603 on dry tires in NQ-Practice 2. The Junior class were able to stay on the slick tyres for each of their sessions and it was the UAE’s Lachlan Robinson who posted a 53.416 only slightly ahead of Guilherme Oliveira from Portugal. The Senior class was also separated by less than a tenth of a second with Bastien Borget (FRA) managing 52.758 and Senna Van Walstijn 52.773. Australia managed to top the timesheets with Ryan Kenned on a 52.416 but South Africa’s Arnold Neveling again showed how competitive the 2018 RMCGF will be with a 52.438. The first Final of the RMCGF 2018 also took place today for the ECK FIA-Americas. It was a home win for Brazil’s Roberto Da Silva Sergio ahead of Karim Bock Hussein and Juan Jose Rodriguez Diaz. The Top 3 was joined by 4th placed Guillermo Gabitto Britez as they all got to compete in the DEKM Rotax Grand Finals this week alongside the Championship drivers. Mixed conditions and extremely close lap-times between many competitors in all of the classes illustrate what an exciting and competitive week we have to look forward too here at Paladino. Tomorrow, the drivers will get three more non-qualifying practices where they can continue to test both the equipment and the track.